Tammy and Rafael wore the Empatica E4. Rafael’s E4 shows that though his overall sleep period was from 10:30pm to 7:00 am, he was up often mainly caring for Wanda and occasionally Sam. Wanda had several seizures during the night. Wanda returned home at 2:30. She was having seizures at school and upon her return Rafael administered non-stop medical treatment. Another peak in his EDA reading coincides with an unexpected bill for thousands of dollars. Later in the evening another EDA peak occurred after Tammy returned home from an ER visit with Wanda. 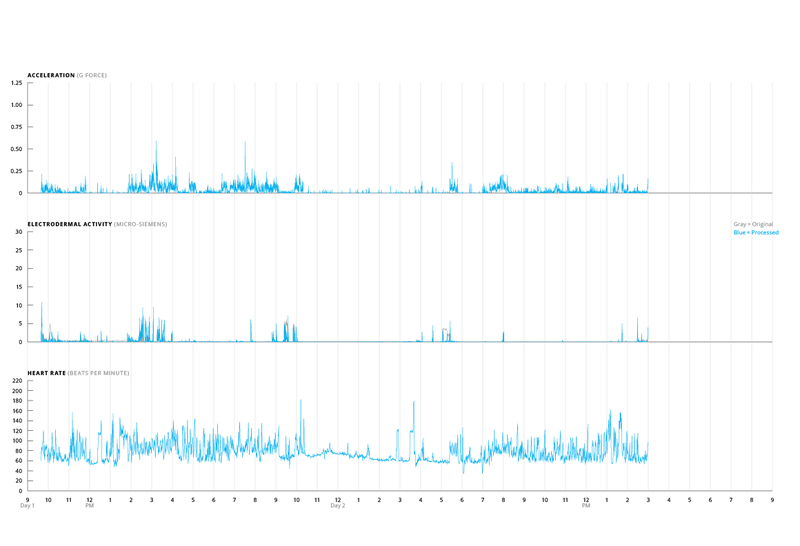 Tammy’s E4 shows her fractured sleep patterns, as well as the ebb and flow of EDA data related to stress. However, no system of reports can accurately describe the constant high levels of stress Tammy and Rafael endure. For now, they work hard, try to keep positive, and plan to keep going until they can no longer.